Book Description: A simple and practical guide to give you keys to hope, wholeness and possibilities in life. Learn to define and redefine your life goals and purpose. Acquire keys to a more victorious existence. Strategies how to live your dreams, and how to live out loud God’s plan for you life. Change your life today! Embrace how to live your life with faith and confidence. 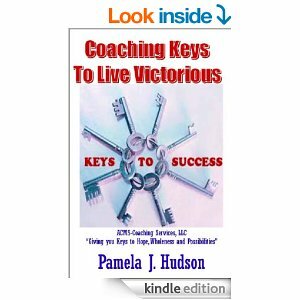 The coaching keys toward victorious living within your reach and now is the best time to make in happen, one step at a time. Get ready to aspire higher, become more motivated to live your best. Let your family and friends see the evidence of a life that is motivated by the Word of God. Author bio: Contributing Writer in the Wisdom and Grace Bible for Teen Girls, by Nia Publishing, Guest Writer on PriorityONE Publications website, Michigan Association for Marriage & Family. Co-Editor of National Biblical Counselor Newsletter and contributing writer to American Association of Christian Counselors and its division, BAACC Newsletter. Director & Treasurer of W.R.A.P. NETWORK, Inc writing group, helping others to write and get published. Missionary, International Speaker and Consultant. President & CEO of Advanced Consulting & Marketing Services. Published article in Grapevine Christian Magazine as well as Detroit Free Press. Former Assistant Director of the Marriage Resource Center of Wayne County.